Every weekday morning at 7:30 a.m., senior Justin Lin rolls into school, adding his bike to the crowded racks by the side of the A building. This is the home of MVHS’ prolific cycling community. Senior Justin Lin bikes recreationally. Photo by Om Khandekar. About 32 percent of MVHS’ student population bike or walk to school every day, according to a Safe Routes to School [SR2S] survey from last year. And recently, the city of Cupertino has decided to focus efforts on making the city more suited for these modes of transportation. On Wednesday, Aug. 30, the Santa Clara County Sheriff’s Department kicked off a “traffic crackdown” and issued multiple driving tickets to drivers violating traffic laws while dropping off students around the MVHS, Lincoln MS and Kennedy MS area. This is just one piece of a citywide effort to keep the roads safe around school while simultaneously promoting more walking and biking. Another is a new silver pole-like structure sitting in front of the doors to the Cupertino Libary. This device is actually a bicycle repair station, installed on July 27. It includes tools for minor repairs and tune-ups, along with a manual pump to inflate flat tires. However, Cupertino is still dense with automobile traffic, as according to statistics from FUHSD, there are about 3,000 car rides going in and out of the MVHS school area every day. Groups like Cupertino SR2S and Walk-Bike Cupertino are trying to relieve this congestion. 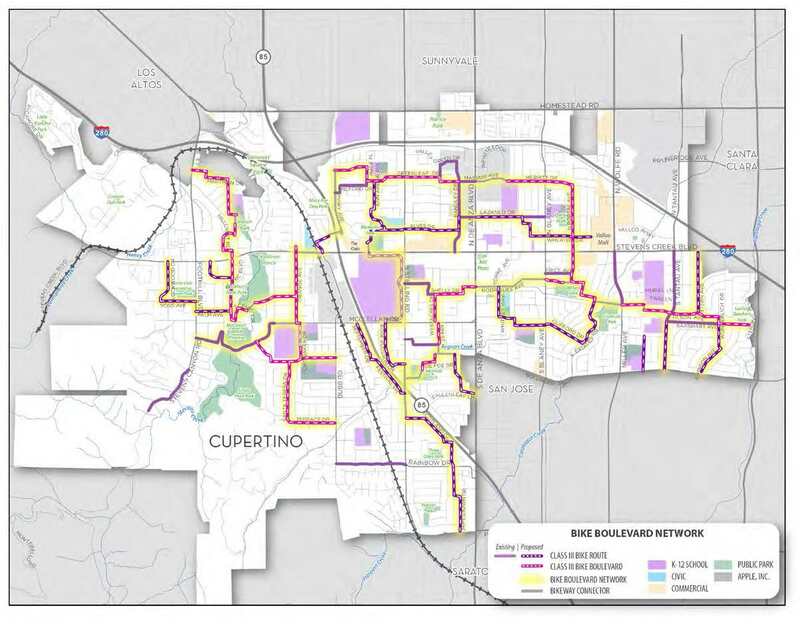 According to David Stillman, Senior Civil Engineer for the City of Cupertino, a new proposed biking plan for the city includes class IV bike lanes along McClellan Road, “bike boulevards” and bike-ped trail facilities. The bike boulevards would lead to changes in residential areas to increase safer driving practices, such as speed bumps and traffic circles, while bike-ped trail facilities would be long extended areas for pedestrians and cyclists, potentially along the Union-Pacific railroad track among other places. The class IV bike lanes would mean more separation than just the previous widening of lanes. A map of current bike routes in the city shows the routes with the most traffic. Photo courtesy of Larry Dean . “You take a bike lane and you put a physical buffer between the bike lane and the cars so that the cars can’t actually cross over into the bike lane,” Stillman said. “And you’ve achieved a class IV separated bike lane.” Currently the top-priority project, the city hopes to begin installing these lanes next summer if all goes according to plan. These large-scale plans are designed to make the city safer for bikers. Walk-Bike Cupertino works on many of the initiatives to promote biking in the city, while still paying attention to safety concerns. An entirely volunteer advocacy group, its goal is to encourage city leaders to construct safer routes within the city for pedestrians and bikers. Founded in 2014 by Larry Dean, the group’s advisory board consists of 10 people and also has nearly 1,000 members. Walk-Bike was responsible for the promotion of many of the changes that students saw near MVHS, including the green bike lanes on Stevens Creek and McClellan as well as another bike repair station on De Anza. As Dean explains, the reason for the high-traffic density around MVHS is no mystery. According to studies, there are about 3,000 car trips made to the area each day. 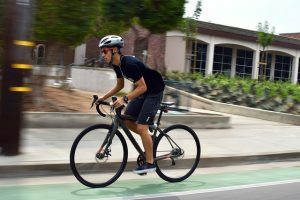 Dean hopes the recent changes in favor of biking and walking in Cupertino can lead to acceleration for more initiatives in the future. Sophomore Vikramaditya Rajpal, who also bikes to school, says the physical changes in the bike lanes near MVHS have helped make him feel safer riding to school. Lin also feels like the extra space in the lanes acts as an asset to student cyclists. Children and adults participate in the bike rodeo at the Cupertino library. Photo used with permission of Chelsea Biklen. While these changes to keep cyclists safer may help, SR2S coordinator Chelsea Biklen says that one of the most important factors of keeping cyclists of all ages safe is biker education. Biklen’s job is to make safe routes to and from school, as the program’s name suggests. SR2S has long encouraged safe biking, whether it be through incorporating bicycle safety education into school time or hosting bike rodeos at elementary schools. At bike rodeos, children learn bike safety by practicing looking both directions and scanning the area while riding their bikes. While Biklen helps organize biker safety events for students, she believes that adults could benefit from the same lessons. SR2S has developed educational pamphlets and materials, but Biklen remarks that this doesn’t necessarily mean they will get read. Dean also mentioned that he would love to get more people from different parts of the community involved in Walk-Bike in order to figure out how to reach other groups of people and help promote safe biking and walking for residents of all ages. He cites the recent education addition in the Cupertino Union School District’s programs as something that he hopes will help bring safer practices to kids. Senior Justin Lin bikes along McClellan Road in front of MVHS. Lin bikes recreationally. Photo by Om Khandekar. Similarly, SR2S also works with schools to host Walk and Bike to School days, which MVHS takes part in, where students are rewarded for walking or biking to school (MVHS does not take part in the reward aspect of the program). Ultimately, this event reduces traffic congestion near schools, further contributing to the safety of pedestrians and bikers. For high schoolers like those at Homestead, bike stampedes allow students to lead groups of bikers that travel to school from designated spots in neighborhoods, allowing for added safety in numbers. But for many such as Rajpal, the feeling of safety that has come from positive changes in biking practices and abilities dissipates in certain situations around Cupertino, especially on the way to school. “On late start Wednesdays, I have to bike on Rainbow Drive and that’s really crazy,” Rajpal said. As Dean said, while the city is working on solutions through various programs and initiatives, the results from them may not be instant.